MOTORS & GENERATORS What sets Ansaldo Sistemi Industriali apart from other manufacturers is our customer-driven design capability. Our motors are not built for stock. They are engineered and manufactured to our customers' specifications. All Ansaldo Sistemi Industriali motor and generator designs are based on a flexible modular structure and developed using modern computer-aided engineering methods. This permits our engineering staff to efficiently configure the right machine for our customers' needs. Our machines provide reliable performance over their entire lifecycle. Series N covers drip-proof, self-ventilated machines. Series W covers weather protected, self-ventilated motors. Series CT covers self ventilated machines with built on air-to-air heat exchanger. The heat exchanger consists of a bank of straight cooling tubes (Aluminium tubes are normally used. Different materials may be used upon request.) Ambient air is forced through the tubes by a shaft-mounted fan. 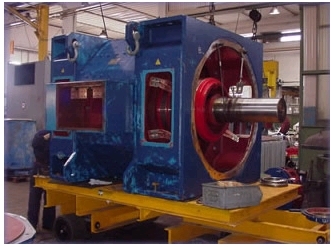 Two internal shaft-mounted fans circulate the primary (internal) cooling air through the active parts of the machine and the tube bank. Series CR covers self-ventilated machines with built on air-to-water heat exchanger. Water intake to the cooler is normally arranged on the left-hand side of the motor when facing the drive end, but can also be situated on the other side upon request. Standard type coolers are designed for a cooling water temperature at intake of 77°F and a water temperature rise of approximately 5K. Series N covers drip-proof, self-ventilated machines. The cooling air is drawn from the ambient through the machines by two shaft-mounted fans. A splash-proof top hat efficiently protects the air intake and outlet openings. Series W covers weather protected, self-ventilated motors. The air, drawn in through a filter located in the top hat, enters the stator frame after three 90 degree changes in direction. In addition, an area of low air velocity prevents the moisture or dirt particles from being carried into the active parts of the motor. Series ET / CAD Series ET covers totally enclosed, self ventilated machines with Ex d flameproof casing and built in air to air heat exchanger. As a general standard these machines are certified for Group IIB + H2 classified areas. We have designed a vast array of machines to operate in temperatures < -20°C as well as for environments that exceed 40°C, and up to 60°C . All series ET machines have been certified by CESI (Centro Elettrotecnico Sperimentale Italiano). Series CAD covers totally enclosed frame surface cooled machines for installation in hazardous areas. External cooling fins and internal fans, streamline air flow for optimum cooling. This optimized cooling system and the special electromagnetic design that went into making this series also make it suitable for variable speed drive applications. These motors are ideal for installation in hazardous areas where Ex d IIB T3/T4 (IEC standards) protection is required. Terminal boxes (line and auxiliary) have also been fully certified as flameproof in compliance with IEC Standards. The quality of our synchronous motors begins with their engineering design. Based on the application needs we will chose the optimal rotor design (clover leaf, cylindrical, solid pole or spider rotor) and size the machine accordingly. The motors are equipped with our standard brushless excitation system which is protected by a specially designed starting device. The Ansaldo Sistemi Industriali series of synchronous motors covers different types of construction, degrees of protection and methods of cooling. All Ansaldo Sistemi Industriali motors and generators are electrically designed and sized to meet your application needs. Series GS The quality of our synchronous generators begins with their engineering design. Based on your application needs, we'll chose the optimal rotor design (clover leaf, cylindrical, solid pole or spider rotor) and size the machine accordingly. The Ansaldo Sistemi Industriali production scope includes a complete series of "medium" sized synchronous generators. They are intended for installation in any type of generation or co-generation plant and for coupling to any type of prime mover, including steam and gas turbines, diesel and gas engines, hydro turbines and wind turbines. 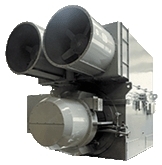 Their design meets the requisites for land, offshore and shipboard applications. Our voltage regulation equipment can be supplied free standing or panel mounted for installation inside customer control cubicle. We also provide the option for remote diagnostics - particularly adapt for offshore or shipboard applications. There are many reasons to choose Ansaldo Sistemi Industriali electric motor-drive systems for your high speed solution. First they are the environmentally friendly alternative. High Speed Variable Frequency Motor-Drive systems provide high efficiency operation over a wide operating range, making more efficient use of non-renewable energy resources. With no harmful emissions, the world can breath easier. These high speed systems also significantly reduce audible noise. A definite advantage when trying to meet tough environmental regulations. Most companies solve your application challenges by installing a motor-drive package on your process equipment. Ansaldo Sistemi Industriali is different. We know that no two applications are exactly the same and that overall process and efficiency gains are more important to you than incremental improvements in your equipment's performance. DC Motors Ansaldo Sistemi Industriali has a complete line of DC motors from 2 to 6,000 kW (at 150 r/min in tandem configuration). These machines provide intrinsic value with the added advantage of Ansaldo Sistemi Industriali's vast experience in engineering design and manufacturing.Over the years, Ansaldo Sistemi Industriali has continued to invest in research and development to improve maintainability and further increase the life span of these machines. Based on a modular design, our DC Series offers a vast selection of mounting arrangements, cooling systems, types of protection and accessories to choose from in order to guarantee maximum flexibility in meeting your a pplication needs. Built to last, these sturdy machines provide reliable service in a variety of industries.